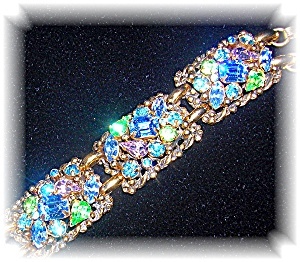 Fabulous BARCLAY Bracelet. It is 7 1/8 inches end to end, 3/4 inches wide, and there is a push clasp, and a goldtone safety also. The Colors are 'Amazing', and SO Brilliant, and Sparkling. There are several shades of Blue, Green, Amethyst, and the stones are round, Emerald Cut, Pear and Oval. This bracelet needs to be seen and worn. The square clasp is studded with crystals.